Imagine waking up one morning at the age of 43, only to discover that the sounds around you no longer exist. How would it change your life as you know it? Read the true story of a bilingual, university educated woman who is suddenly dismissed as too stupid to learn, work, drive or even catch a bus, while the audistic world around her refuses to allow her access to an interpreter after she is diagnosed as profoundly Deaf. She thinks she is a positive person but is sadly bitter. Too much negativity to finish. She also repeats advice and stories like peek hole, flashing lights and calling emergency services - I’m not sure if anyone edited this book. 5.0 out of 5 starsA Must Read to Build Bridges between the Deaf and Hearing Worlds. 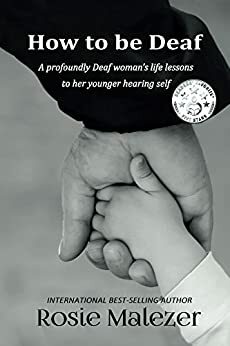 If you have a Deaf or Hard of Hearing loved one or friend, this book is a must for you to read. If you are losing your hearing and need support, this is also a must read. As somebody who is losing her hearing, I found myself nodding in agreement with every paragraph in this book. It was nice to know that there's somebody who understands the challenges of being Deaf/Hard of Hearing in a hearing world. I found this book very helpful. It was recommended to me. I am loosing my hearing late in life...pointed me toward resources and helped me to understand what I can expect. I love the way how the author setup the book. She give her experience and then the do's & don't. This is a very informative and necessary book for anyone who is or knows a Deaf/deaf person. Loads of great advice on how to deal with life if you have suddenly found yourself deaf or have a deaf child. I wish I had known of this book when I first lost my hearing. It would have made some things so much easier to handle. I feel this book is a "must read" for all, as it it's a wonderful view into the Deaf community and would help build a bridge between Deaf and hearing people.